Hi everybody. Here, at last, is an update. Shortly after Tom made his last post for me my back condition greatly worsened. I’ve spent most of the past three and a half weeks lying down. Thanks (?) to x-rays, MRIs, and an EMG, I now have a diagnosis: a herniated disc and a pinched sciatic nerve. At least now we know the cause of the pain. After exhausting all other forms of treatment, I’ve decided to have surgery on September 22; I’m hoping that there will be a cancellation so that I can get in sooner. Unfortunately, Friday I had to cancel my post-cataract vision exam since I can’t sit long enough to complete it. I hope to be able to get new glasses in October. In the meanwhile, I’ll continue to struggle with the drug store ones. They’re not very good, but they’re better than nothing. For the time being my needlework has taken a back seat. Hopefully in another few weeks we’ll be able to get out the automatic with the three new products. Tom talked me into posting pictures now even though we haven’t finalized the names of two of the products. Here is Mrs. Waddelow’s Needlework Basket. 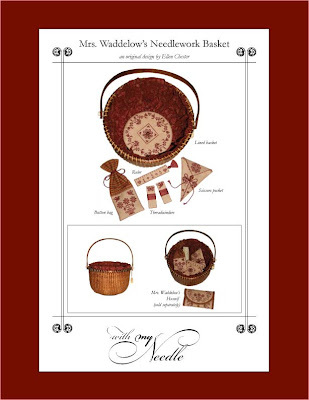 The package includes charts and detailed stitching and assembly directions to make a lined basket with an embroidered bottom panel, two threadwinders, a ruler, a scissors keeper, and a button bag. These designs are companion pieces for Mrs. Waddelow’s Huswif, which was released earlier this year. On the positive side, we are very excited about the anticipated arrival of our newest grandson, who is due in eight days. I sure am glad that I got most of his birth sampler stitched before going out of commission. Thank you for all your notes, prayers, and even surprise goodies. Sending good thoughts and prayers, Ellen. I hope you can have your surgery sooner than scheduled. I love your future release -- so pretty! Sending positive thoughts from Portugal and hope all is going to be well for you and the baby. Oh Ellen, you've just had a string of health issues to deal with... and I'm so sorry to hear about all your pain and discomfort. I'll be keeping my fingers crossed and sending positive thoughts your way for a successful surgical procedure. I'm so hoping you can put this all behind you soon. Your new chart is wonderful. Wow Ellen is that ever gorgeous. I just love it and am really glad that you finally know what's wrong with you. It sure has been a long haul and sorry I haven't emailed but I promise to later. i know what you are going thru i had a similiar problem in the 80's. i had 2 surgeries and must admit my pain level is much lower than before. i can sit and sew. good you are having surgery right away i waited a year and i think that messed me up more. good thoughts your way. i know you will be fine remember to give yourself lots of time after to heal. Ellen, it must be a relief to know what is wrong and I wish you all the best for your surgery, I'll be away on holiday then, so won't be able to write. My Mum had that surgery years and years ago and has never looked back. LOVE the new Mrs Waddelow, I'm a sucker for basket projects. Wishing you all the best Ellen. Love the Mrs W accessories. The waiting must be almost as awful as your back! I'm sorry you're in so much pain. You have my prayers, and I hope your surgery and recovery come very soon. Ellen, best of luck on your back surgery. I have had that surgery and it is worth every minute of it. Relief was immediate. Best wishes on your upcoming surgery. Hope you bounce back quickly! Good luck too, with the new grandbaby! That is exciting! Love the new companion pieces to Mrs. W....do they hit stores soon? that pain will be long gone. I am so sorry about your back. I have a compressed disk and have experienced sciatica - to the point where I had to have electric stimulation 3 days a week to make it go away. NEVER want that back again! I can imagine your pain and it is terrible! I will be thinking of you on the 22nd - hope all goes well and you're back on the road to recovery soon. Relief to your schiatic nerve is absolutely IMMEDIATE! I couldn't believe the difference after I had back surgery -- 15 years ago! Have not had a lick of Schiatic problems since! Good luck to you and here's to a quick (mine was) recovery! I've been thinking of you Ellen. I hope, before too long, you won't be in so much pain. Take good care of yourself.